Twice in the second half of the twentieth century, in the midst of a robust economy, economists optimistically talked about the taming and even “the death of the business cycle” based on the belief that advances in macroeconomics had reached a point of perfection. Yet, both times, the economy underwent serious turbulence and the policies that seemed to have “solved the problem” proved inadequate to the challenges presented by unexpected realities. In the 1970s, the “neo-classical synthesis,” with its faith in forecasting and macroeconomic “fine tuning,” succumbed to stagflation and a new theory, the Monetarist paradigm, came to prominence. By the 1990s, Monetarists and their descendants— the rational expectations and New Keynesian models—had convinced themselves, and policy makers, that they could stabilize the economy for good and that policy intervention beyond interest rate adjustments and inflation targeting was no longer necessary. The Financial Crisis of 2007-8 and the subsequent “Great Recession” should have been a wake-up call that, just as in the 1970s, instability was not gone and that a new paradigm for running the economy was needed. Yet, as of today, the orthodoxy continues to dominate the policy debate in the United States and in Europe shaping inadequate policy responses to the main problem of contemporary capitalism: the persistence of private debt overhangs and their impact on both short run and long run growth. However, rather than examining these issues, OECD countries—Europe in particular—and many emerging markets have continued to embrace a framework under which central banks setting the “price” of money, or setting the quantity of the “monetary base”, is the only game in town. Accordingly, the world’s central bankers have launched a series of ad hoc stabilization programs, driven by extensions of the Monetarist/New-Keynesian paradigm, which evidently do little to address the consequences of the financial crisis. An essential element for constructing a more effective policy framework for understanding our current private debt driven malaise is a greater appreciation of the macroeconomic consequences of debt. However, the dominant economic paradigm has ignored the importance of private debt levels for the long term growth and stability of the economy. And it has propagated an inaccurate picture of the relationship of private debt to the fiscal stance of the state. Rather than understanding how public debt can validate private savings and spur private investment, the Monetarist/New-Keynesian framework has confused fiscal expansion with the expansion of the size of the public sector. This has limited the options of policy makers and put the OECD, and many emerging, economies on a path toward economic stagnation. In this piece, I will review the assumptions of policymakers in the United States and in Europe, spell out their policy shortcomings, and suggest steps toward achieving sounder policy options based on fiscal policy. The evidence for what needs to be done is staring us in the face and the economics profession must begin to connect the dots between public debt, private debt, and personal savings. A debt-driven perspective allows us to break the remnants of the Monetarist orthodoxy, including recent calls for direct monetary financing, or “helicopter money,” and construct an argument for the effective deployment of fiscal policy. The Great Recession has offered a grand ‘natural experiment’ to test the theory that central bank action is the most effective tool for steering the economy along its long-term path. According to this majority view, the manipulation of interest rates is the most effective lever for optimizing macroeconomic outcomes. This occurs by setting policy rates in response to expected inflationary pressure, on the condition that central bankers act independently of ‘short-sighted’ government preferences. This highly commended strategy did not prevent the financial, banking, and economic collapse of 2008, and yet, notwithstanding this failure, central banks have remained on the center stage of macroeconomic governance. When it became clear that they were coping with new conditions, central banks deployed a range of exceptional measures that nevertheless conform with the pre-crisis policy paradigm. Unconventional policies such as balance sheet expansion or negative interest rates have marked no fundamental break with the prevailing framework of monetary policy, as they continue to aim at traditional targets: lowering interest rates across the yield curve, raising inflation expectations, boosting the supply of credit, and triggering the private sector to borrow to spend. Far from offering a new approach, “unconventional” monetary actions are rooted in the assumption that the economy needs bigger doses of the same old medicine. If interest rates are not low enough, they can be set to zero, or even below zero; if low policy rates are not enough, central banks can buy assets and enlarge their balance sheets to issue more currency; if inflation is too low, central banks may even consider raising their inflation targets. Unsurprisingly, eight years of unprecedented low-interest rates and an unparalleled flood of liquidity engineered through central bank asset purchasing programs have yielded disappointingly weak growth in bank lending in the US and even more anemic outcomes in Europe. Yet, the belief that monetary policy should be the main driver of economic interventions has remained largely unchallenged, to the point that the differences in the economic performance of Europe and the US are often explained on the basis of differences in monetary policy implementation (choice of tools, timing, readiness to act), while ignoring the relevance of fiscal policy divergences between the two regions. The importance of fiscal policy as a deciding factor in economic recovery from a debt-driven crisis is clearly visible in comparing the post-2008 experiences of the United States and Europe. While the US economy recovered slowly from the freefall of 2008-2009, its growth was considerably faster than that of the Euro Area’s (EA), as the latter soon entered a second, double-dip, recession. Between 2008 and 2014, the EA’s average annual growth was a negative 0.25 percent, compared to a positive 1.4 percent in the United States. Europe’s painfully low real incomes and high regional unemployment, especially among youth, have created a fertile breeding ground for resentment towards national governments and skepticism about the euro and European integration at large. A fact that has become obvious even to the most skeptical observer with Britain’s vote to leave the EU. A number of commentators have attributed the US economy’s stronger growth performance to the allegedly more aggressive approach of the Fed when compared to that of the ECB. Yet, these same commentators ignore the larger differences between the fiscal stances of the two regions. After 2008, the US general (federal, state, and local) government deficit reached 12.6 percent and remained above 8 percent for five straight years, while the overall fiscal deficit in the EA (all national governments combined) exceeded the 3-percent political threshold for only four years and was never above 6.3 percent. Charts 1 and 2 show the difference between American and the EA fiscal approaches. While in the US, fiscal deficits were de facto permitted in order to accommodate the downturn, fiscal discipline became top priority in Europe in 2010, as the recession pushed the deficit/GDP ratios of all EA countries (except Luxembourg and Finland) above the 3-percent threshold. 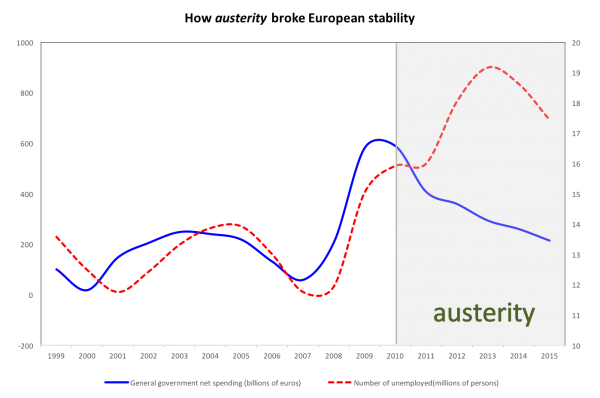 The ‘austerity’ measures that followed (consisting of spending cuts and tax hikes) began to act pro-cyclically, worsening the recession in the EA. While the absolute value of overall public deficit fell, joblessness rose dramatically. As Chart 3 demonstrates, the recession, and the austerity-driven deflation that followed, exacerbated differences between EA regions. The effect of austerity was exacerbated by an interpretation of treaty prohibitions against monetary financing that prevented the European Central Bank (ECB) from purchasing national debts. In the midst of the crisis, this practice seriously hampered the single currency, as the ECB was no longer able to maintain a common interest rate throughout the EA. In 2012, when it was clear that this approach was leading the EA to the brink of operational implosion, the ECB reformed its operational practices and became willing to be an unlimited buyer of government debts, on the condition that the governments complied with EU guidelines. While the monetary union was no longer in danger of undergoing an operational breakdown, a second phase of the EA crisis was on its way because the deflationary bias of EU fiscal rules were not relaxed. Rather they were made even stricter. Before moving on in our comparison, there is one important reason for pausing to discuss the conceptual and political backgrounds to the EA’s fiscal rules. Europe has become the sick man of the world economy, and its fragile polities are now under extraordinary pressures from migrant flows, populist movements, and a rising discontent with European institutions. If its fiscal rules are an important part of the problem, then a valuable solution must entail some form of revision of such rules. European institutions were built on the premise that expansionary fiscal policies have limited effects on the economy, and that these effects are likely to be more than offset by the consequence of rising public debts. This belief belongs to the policy consensus that reached its apogee during the “Great Moderation” of the 1990s. It remains relatively hegemonic and guides the policies of most major developed as well as many developing economies. The current EA consensus traces its origin to a branch of public choice theory. Public choice theorists argue that it is politically easier to increase spending on entitlement programs (such as social security and other compensations or benefits) than to raise taxes. Voters are inherently biased towards government deficit spending and governments are inherently biased towards enlarging their size well beyond what is economically sustainable. To solve the problem of the short-term horizon of voters in the democratic decision-making process, public choice theorists argue that an institutional structure that limits the ability of governments to meet voters’ preferences for more spending must be established. If we accept the notion that governments are incapable of responsibly exercising the ability to create money, then the power to spend should be divorced from the ability to spend. While governments maintain the power to create and allocate the wealth generated by its tax receipts to the private sector, the monopoly power of issuing the quantity of currency should be transferred to an independent central bank. This means that any government spending in excess of tax revenue must be funded by borrowing from private holders of the national currency rather than by compelling the central bank to fund it. To avoid any disguised political pressure on the central bank, the latter should be formally prohibited from funding deficits. This principle became a central organizing principle of the architecture of the EA. Members of the monetary union agreed to complying with fiscal rules and permanently losing access to central bank money as a price to be paid for EA membership. Governments could fund any spending in addition to tax revenue only by issuing credit-sensitive debt to the private market. Separating the power to spend euros from the power to issue euros was considered an opportunity to induce public sectors to lose their hefty weight. Accordingly, the goal of moving Europe towards a new growth model based on the private sector also entailed that (biased) voters would not be asked to implement these changes. Rather, they would be compelled to face the ‘full cost’ of social programs. It was thought that once governments were forced to fully fund their spending with taxes, the consensus for social programs and big government would disappear. This entailed the assumption that communicating the benefits of a ‘culture of stability’ through government budgets would strengthen political support for the structural changes and that, in turn, the positive effects on growth would come fast. Things did not go this way, and when the crisis burst, it triggered a pro-cyclical reaction that made Europe the economic region with the slowest growth in the world since 2000. This unfortunate outcome is the result of the mistaken belief that fiscal discipline is the best tool to downsize the public sector and thus create the conditions for higher growth. All of this has led to a muddle at the core of today’s policy debates which conflate two problems that should be treated separately. One is the question of whether or not a smaller-sized public sector can be a factor of growth. The other is whether or not smaller public debt can be a factor of growth. These are profoundly distinct issues. The question of the optimal size of the government sector is the question of the (direct and indirect) allocation of real resources to the public purpose. Evidently, if more people are hired to manage government programs, fewer people are potentially available to produce private goods, and the desirable balance is found on the basis of a political evaluation of the net benefits of government programs. The optimal size of public debt, and correspondingly the question of an optimal tax revenue for funding a government of a particular size, is a wholly different question. 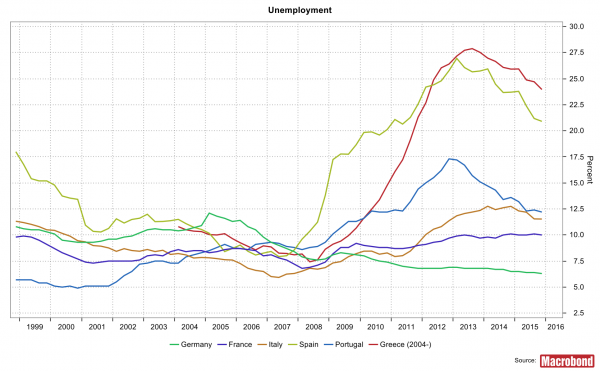 As observed in the European experience, when tax revenue is too high, the macroeconomic effects can be very harmful. Indeed, a ‘sustainable’ fiscal policy cannot be based on the premise that the budget should be balanced at any given time horizon. Rather, a ‘sustainable’ fiscal policy can only be defined in relation to the dynamics of savings, debt, and private spending, and to its ultimate effects on employment and economic prosperity. As European fiscal rules were meant to provide the ‘full cost’ of the public sector, both the advocates and the detractors of “big government” have been watching the size of public debt with equal concern. While the latter consider public debt as a signal that social programs are more ambitious than what the country can afford, the former would like to see public debt downsized so as to create more room for socially useful programs rather than debt service payments. Unfortunately, both these positions confuse the financial function of the fiscal stance in a modern monetary economy with the question of the optimal size of the public sector in any given society. It suffices to consider the fiscal positions of the US and the EA: while the public sector’s share in the US is much lower than in Europe, the American government deficit was about twice as large and helped smooth the deleveraging of the private sector after the crisis. 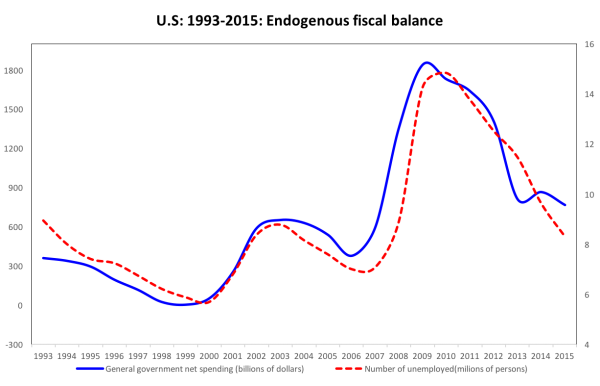 Regrettably, understanding the financial function of government deficits has disappeared from the public policy agenda. Europe’s firmness on fiscal rules at all levels of government is evidence that this essential characteristic of a modern monetary economics is not understood by policy makers. It is well known that a monetary economy is driven by spending and that businesses are willing to produce the amount of output that they can sell. It has also been long understood that if income recipients save part of their incomes in the form of financial assets instead of spending them in goods and services, this will not allow all output to be sold, unless some other economic unit is willing to spend more than its income and thus offset the effect of these savings. This is often described as the equilibrium between savings and investment. However, this manner of framing the dilemma is misleading for two reasons: any private deficit spending (not just investment) can act as the offsetting factor to savings; and financial savings must equal debt, not investment. Excluding, for simplicity’s sake, the option of drawing from past savings, any spending in excess of one’s income entails some form of borrowing. Thus, given people’s legitimate preference for saving a part of their income, the economy can only be stable if there is an equivalent amount of (private or public) deficit spending. Because spending in excess of income is made possible by issuing IOUs, and because savers store IOUs for future spending, it can be said that 1) by generating additional demand, any deficit spending offsets savings, and 2) by generating additional IOUs, any deficit spending offers savers the means to save. This is what I called the savings-debt constraint. I argue that the stock of financial assets available to meet desired private savings must be equal to the existing outstanding stock of liabilities. In other words, any increase in financial savings must be validated by the creation of an equivalent amount of new outstanding liabilities. 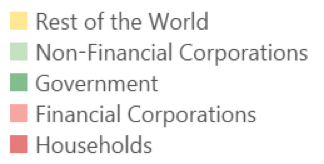 These include a) liabilities issued by private residents (private debt), b) liabilities issued by various levels of government (public debt), and c) liabilities issued by foreign (private or public) entities, , i.e., claims on foreigners that residents hold when the country’s current account is positive. The savings-debt constraint has a corollary. If private spending depends on the saving target of the private sector, then private spending depends on the stock of debt that validates savings and is considered to be sustainable. In other words, private spending is a function of the relationship between desired savings and consented indebtedness. The “Great Recession” is an example of a slump triggered by the mismatch between desired indebtedness and desired savings. If some private entities seek larger savings to repay debt and/or restore the desired stock of savings that they lost, while credit growth drops because other private entities have reached their target level of indebtedness or because of rising credit risk perception, then private spending falls. That is unless public debt is allowed to quickly increase to compensate for the gap between desired borrowing and desired saving. Consequently, an increasingly large stock of public debt is needed during a time of deleveraging. An increase in public debt may also be needed to prevent a downward spiral in income when private credit growth stops supporting income growth. Thus, the most important function of public debt is to supply the economy with the stock of currency and government securities that supports the structure of private debt. 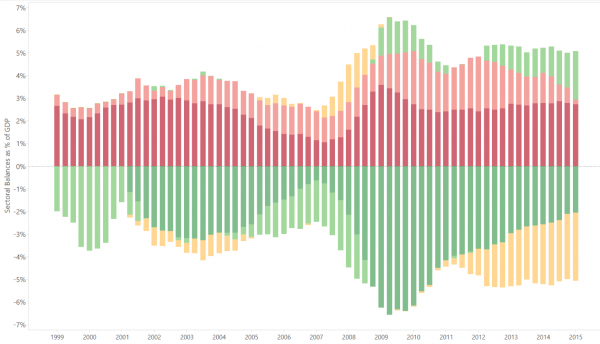 Chart 4 shows how deficit spending, private or public (measured by the bars below the zero line) supports the financial savings of European entities in the EA (measured by the bars above the zero line). Between 2008 and 2010, the private sector engaged in a massive balance-sheet adjustment. When the rate of income growth slows down or debt holders reassess risk, in an economy where growth is largely driven by private debt as was the case in both Europe and the U.S., the cycle may reverse violently, as private entities desire more savings and at the same time are less willing to borrow. When this occurred, the public sector deficit (to wit, the combined deficits of all EA countries) was the only support to the private savings of Europeans, thus initially preventing a deeper recession. This demonstrates the anti-cyclical function of fiscal deficits. During downturns, tax collection mechanically drops, thus offsetting the pro-cyclical effects of the recession. It ought to be noted here that fiscal rules tacitly assume that a 3% deficit/GDP ratio should suffice as an anti-cyclical protection, with this assumption being rooted in the notion that private sector’s spending is ultimately self-adjusting. Then, from 2010 onwards, contractionary deficit-reducing policies (aka ‘austerity’) removed support for private financial savings. The 2010-2012 recession is proof that in the midst of the deleveraging process the private sector was aiming at saving more than the actual flow of financial savings allowed, thus forcing cuts in private spending. Luckily, after 2013, at a time when public deficits were being downsized in an attempt to comply with fiscal rules, foreigners’ deficit spending on EA output played the compensating factor, thus providing temporary support to output sales and preventing further declines in output so far. This is the chief reason why I believe that the Monetarist transmission theory has serious faults. Monetarist quantity theory explains private spending with reference to money holdings: when economic entities have more money than they desire, they will spend it. However, this definition of “money” only includes currency in circulation and bank deposits (the ‘money supply’), and thus provides only a partial measure of the forms in which financial assets can be owned by the private sector. It is much more reasonable to explain private spending as triggered by an overall assessment of the total of financial assets owned by the private sector, and not simply of the most liquid component on the asset side of balance sheets. Narrowing the basis of private-spending decisions to one single type of asset (i.e., money balances) is misguided and unrealistic. This belief, that the central bank can always spur greater private spending by creating excess money balances, was one of the assumptions underpinning the policy of large-scale asset purchases better known and Quantitative Easing (QE). Proponents argued that QE could spur private spending in the aftermath of the Great Recession. Yet, if my analysis is correct, an increase in currency or money balances is neither a sufficient nor a necessary condition for triggering greater private spending. What matters is the relation between desired indebtedness and desired savings. The fundamental question about the effectiveness of central bank policy then becomes: does monetary policy affect the relation between desired indebtedness and desired savings? From the above analysis, we can begin to assess its three main transmission channels. The first depends on the efficacy of monetary policy in boosting credit growth. This is the channel that was mostly dead during the crisis. The second, is the effectiveness of monetary policy in boosting net exports via currency depreciation. In spite of its popularity, and even assuming that the central bank can engineer a currency depreciation, this channel does not produce a net increase in spending in the world economy, but only redistributes spending from one country to another. The third transmission channel depends on the central bank’s effectiveness in directly supplying additional financial assets and deserves greater discussion. Neither ‘conventional’ nor ‘unconventional’ monetary policies have proved to be valuable tools in this respect. Cutting interest rates redistributes financial assets between borrowers and lenders. Rate cuts lower the flow of debt service paid by the government to private holders of public debt, thus reducing the supply of financial assets available to the private sector. When central banks purchase private or public debt, they modify the composition but not the overall level, of privately owned financial assets, and they also become the recipients of any cash flows from debt issuers. This implies that when the central bank is the holder of more bonds and securities, financial assets get transferred from the private sector to the public sector in the form of debt service payments, thus further reducing the supply of financial assets. Finally, negative rates on reserves work as a tax, and only negative lending rates can work as a subsidy to banks. In contrast to central bank policy, net government spending always provides a direct flow of financial assets to the private sector. This is because the difference between what the public sector spends on the private sector and what the public sector collects from the private sector (taxes) is a net addition to the stock of financial assets (currency and other liabilities of the public sector) that the private sector owns. This becomes the best option in times of deleveraging, on condition that the central bank faces no constraints in keeping public debt fully liquid by letting the currency float, and by standing ready to be an unlimited buyer of public debt if need be. The Great Financial Crisis was the outcome of private debt having outrun income growth to the point of creating the conditions for a systemic collapse. This is said to have caused private debt to be ‘absorbed’ by public debt, thus shifting the ‘burden’ on to public finances. In Europe, this indeed threatened the sustainability of member countries’ finances. Under existing fiscal rules, letting public debt rise in response to the crisis was not an option, and this impediment made deleveraging in Europe comparatively more painful than it was in the United States. While EA governments were compelled to retrench, thus exacerbating the recession, the rise of public debt in the U.S. partly attenuated the effects of the decline in private-sector spending. With no fiscal support, the pro-cyclical effect of the decline in income in Europe was brutal (albeit unevenly distributed across the EU). EU policy-makers seemed totally unaware that forcing fiscal retrenchment during a time of debt deleveraging meant giving up one key source of debt that could support a rising demand for private savings. When an increase in public debt is not an option in offsetting a fall of credit expansion, macroeconomic policy runs out of ammunition. Public debt restructuring or cancellation only causes further losses to its holders pushing down demand even more. In this situation, only a positive external balance can offer a temporary solution. My argument, that sustainable economic growth structurally needs fiscal support may appear preposterous in the context of the last 20-25 years of ‘Great Moderation’ prior the global crisis, when discretionary anti-cyclical fiscal policy played a very marginal, if any, role. The fact that non-inflationary growth was obtained without discretionary fiscal policies was considered proof that a market economy is fundamentally self-adjusting and that all is needed is a central bank aimed at price stability. This same belief is the basis for the view that the crisis must have been caused by central banks setting the ‘wrong’ interest rates, thus sending the wrong incentives to private agents. This also implies that the solution is not to restore obsolete (and potentially destabilizing) fiscal policies but to let deleveraging unfold and implement structural changes and reforms as needed. Through the 1990s, the increased demand for savings was supported by an extraordinary rise in private debt, complemented by a big wave of new public offerings. Average income growth continued, but became increasingly vulnerable to disruptions as household debt burdens increased. When the crisis hit, governments were forced to rescue big, systemically important financial institutions fueling resentment against “big government” and the rise of powerful populist, anti-establishment political movements. Instead of providing a stable fiscal support to growth, states in the developed world found themselves fighting brush fires by rescuing the financial sector. Yet the cause of the conflagration was not an unpredictable accident such as a random exogenous shocks, or a random accident that could have been prevented with more careful supervision. It was because of grossly mistaken economic assumptions, based on a flawed model. In economics, as in any social science discipline, theories that become well established and ‘orthodox’ are not always ‘the best-known answers’ available. The analysis above is at variance with a number of beliefs in mainstream economic thinking. Yet, the essence of this analysis draws from a number of past and current contributions, providing a better account of the policy failures before and after the Great Recession. We only need to connect the dots. The flow of private spending ultimately depends on the relationship between the desire to accumulate financial savings and the growth of (private and public) debt that validates and offsets those savings. When private credit expansion is the main factor supporting growth, the economy becomes increasingly vulnerable. At high levels of leverage, a slowdown of income growth can trigger a violent downward adjustment of the imbalance between saving desires and sustainable indebtedness. When an imbalance between saving desires and sustainable indebtedness develops, a timely fiscal adjustment acts as a stabilizing factor and prevents a financial crisis from spilling over into the real economy. Public debt can and should be kept sustainable by the central bank acting as a potential buyer of public debt and letting the currency float. Setting monetary financing limits to the government can be highly harmful, as the near implosion of the euro in 2012 proves. Setting limits to public deficits and debt curbs the ammunitions needed to prevent a downturn. Predictably, this makes a powerful case for reclaiming the fiscal tool as an active policy instrument to prevent financial instability from spilling over into the real economy. This, however, does not necessarily entail restoring the 1960s, neo-Keynesian fine tuning approach. Supporters of discretionary fiscal policy have always acknowledged implementation problems. Indeed, history offers a number of examples of the two very contradictory kinds of risk: unrestrained issues of public debt (often including massive purchase of foreign currency) often ends in hyperinflation; and fixed limits to public debt (often justified by a buoyant economy driven by private debt) ends in financial and economic collapse. A better design of fiscal policy should include an independent institution’s (perhaps a central bank) assessment of the consequences of the current mix of private and public debt and an independent policy-making institution’s assessment of the right level of taxes for the current level of discretionary government spending. A job guarantee program could automatically generate fiscal deficits in response to fluctuations in the business cycle. These tools can close the output gap without requiring the now popular “helicopter money” approach. This proposal, advocated by commentators left and right, would have the central bank directly finance a portion of net government spending. Its logic draws from the Monetarist model where spending depends on the quantity of money rather than financial savings in the economy, Yet, as demonstrated in this piece, the form in which public debt is owned by the private sector has no direct impact on savings and debt and should be irrelevant to spending decisions. Indeed, one could argue that the massive purchase of government debts by central banks during the financial crisis was already a form of “outright monetary financing,” with no visible consequences for economic growth. The ‘helicopter money’ approach seems most concerned with promoting a fiscal expansion that does not create more public debt in the hands of the private sector. Yet, the best policy response to the inherently cyclical tendencies of the private sector is to construct a policy framework that, while meeting the concerns of limiting spending abuses by governments, fully and efficiently addresses the question of the financial function of public debt as a key stabilizing factor in a monetary economy. The longer we avoid addressing this problem, the longer we will be doomed to using ineffective policies to the most pressing economic problem of our times. Andrea Terzi, ‘A T-shirt model of savings, debt, and private spending: lessons for the euro area’, European Journal of Economics and Economic Policies: Intervention, Vol. 13, No. 1, 2016, 39–56. It would be helpful to define "deficit spending" for the U.S., England and other nations issuing a non-convertible, fiat currency with a floating exchange rate and no debt in a foreign currency, as "net national investment" and "national debt" as "national savings." Governments sovereign in their currency never need income/revenue per se to fund themselves. They simply issue more IOUs. For these nation's tax policy serves to manage inflation, income distribution and acceptance of the currency. Nor do these nations "borrow" to fund their expenditures. The "borrowing" manages the term structure of central bank interest rates and does not generate revenue for federal government spending. QE amounted to asset swaps. Moreover, when public and private entities purchase gov securities they exchange non-interest earning currency for interest-bearing government securities. Much the same as any citizen purchasing CDs. In no way should this be described as debt. It's savings.